Engineered by the Precursors with bioluminescent bone spines, Shrikethorn's body is adorned with razor sharp spikes which it launches with a whip of its tail, firing a salvo of lethal projectiles at its target. Shrikethorn comes to us from the same Sofvi Spirits line as Raijin - but while I was able to get that big-headed monster at Toys Я Us, that's no longer an option (thanks, Capitalism!). Luckily for anyone who doesn't want to pay importer prices, some big chain bookstores have a general "Japanese toys" section with Gundam models and whatnot, which is how I was able to bring this dude home from Barnes & Noble. 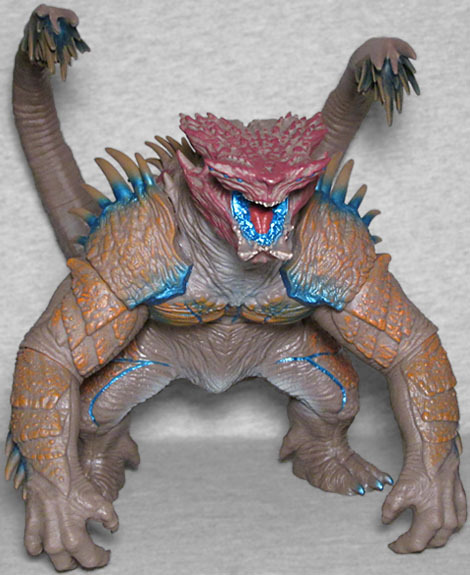 The kaiju designs in Uprising don't feel as impressive as those in the first Pacific Rim. 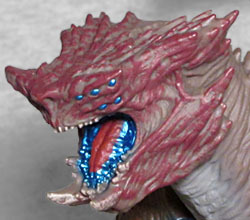 Part of that is the inevitable consequence of losing Guillermo del Toro's monster-loving influence on the design process: he pushed the artists to give the beasties a grounding in reality, while now they're just free to go hog wild, without even the "a human being needs to fit inside this suit" limitation that Godzilla and Power Rangers have to keep them from going totally insane. Shirkethorn is proportioned somewhat like Leatherback from the first film, with long arms and short hind legs. But while Leatherback kept his mass mostly in the center, turning him into a giant, frightening block, Shrikethorn spreads his arms wide - a much more commonplace pose. "Oh, but Shrikethorn has two large tails," you say. "That's totally different!" 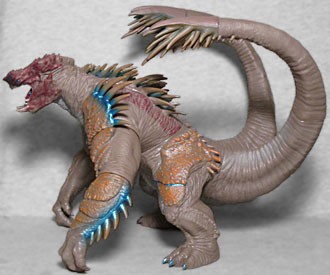 Yes, it is, and it goes back to the way the older kaiju were at least partially influenced by real animals - giving him two tails makes him more alien, but less identifiable. When the creature is based on a bat or a shark, you can just accept that part of the biology and worry about mentally processing the changes to the changes that have been made; with this, you look at it, and you're spending your time trying to parse its scorpion... porcupine... puppy... body? ["Scorpuppine" --ed.] Wow, yeah, that would have been a much better name than "Shrikethorn." Shrikethorn is not as dark as Raijin was; at least, the toy isn't; the ones in the movie all seemed to be the same shade of muddy tan, but the toy has more of a red tint to it, especially on the armored plates on its limbs. 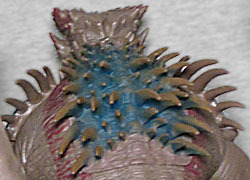 It does share the same metallic blue accents, painted mainly around the base of all the spines, but also filling the interior of the mouth. Electric bites! The bright red tongue contrasts really well against that field of blue, too. 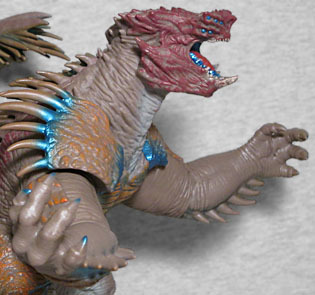 The articulation is better here than it was on the previous Sofvi monster we reviewed. Stilll not great, though. Shrikethorn has joints (or at least joins) at the tails, waist, elbows, and shoulders. All of those are swivels, and some definitely move better than the others. The waist barely wiggles, for instance, and might just be a construction seam. The tails are a little better, and the arms appear to be intentionally moveable. There's no pulling the tails back for a "flicking" pose, though, and no separate quills to shoot out even if you could. Shrikethorn is a pretty sizeable toy - his tails are the tallest part of him, of course, reaching more than 6¾" tall, but he's also about 6" wide and 8½ long. 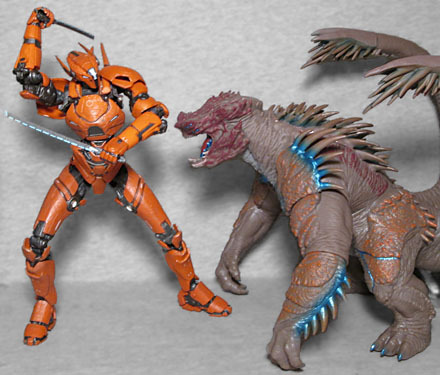 Bandai/Tamashii Nations' Robot Spirits line is in a smaller scale than DST's Pacific Rim: Uprising toys are, so this technically is too small to fit in that collection, but the difference here is no more blatant than NECA's first Knifehead was.